M. “Robert” C. Riess, Jr. has been heavily involved in construction litigation and complex natural gas and burn injury matters. He also defends the interests of insurance companies and their insureds in personal injury, property damage, construction defect and premises liability actions. He approaches issues with a practical perspective of finding efficient solutions and has been involved at every phase of litigation. Robert has also represented people and businesses in transactional matters and disputes including contract negotiations, business formation, intellectual property, product warning disclaimers and non-profit formation. 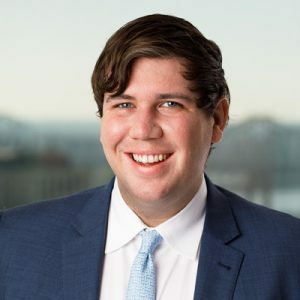 During his time at Tulane Law School, he clerked for Louisiana Supreme Court Justice Jeffrey P. Victory and was a legal intern for the New Orleans Headquartered company Intralox in their Shanghai, China Office. Natural Gas Liability: Lead Associate in defense of an Indiana natural gas company resulting in favorable settlement for client against claims made against it by plaintiffs with 25% to 70% total body burns. Negligence: Lead counsel in obtaining a settlement for a child care operation in defense of claims by a child who was injured after swallowing a foreign object at a day care. Appeal: Prepared brief for Application for Supervisory Writ granted by Court of Appeal holding that plaintiff acted in bad faith in naming her UM carrier, resulting in favorable judgment of improper venue and transfer of suit to proper venue. Berthelot v. Great Midwest Ins. Co., 2016-0881 (La. App. 1 Cir. 10/31/16), 2016 WL 6426490. Trucking Liability: Lead Associate in defense of trucking company and its driver resulting in a favorable settlement. Negligent Demolition: Defended property owner against adjoining property owner in negligent demolition of common wall resulting in settlement favorable to client. Premises Liability: Defense of a gas station against claims made by patron for trip and fall at entrance and resulting injuries to knee, hand and shoulder. Products Warning Disclaimer: Drafted warning disclaimer and corresponding instructions for use for client’s automotive product.